Demonstrators throughout the world gathered Monday for May Day protests in favor of labor rights. 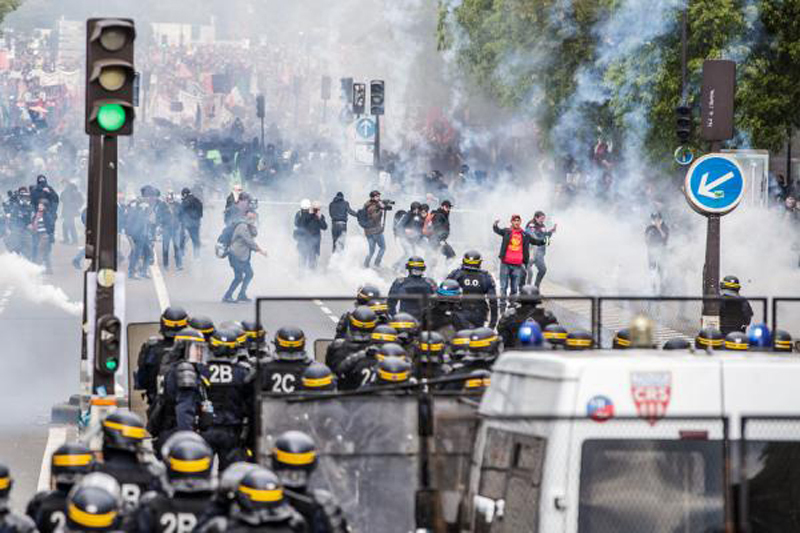 A demonstration in Paris, France, turned violent when a group of about 1,200 protesters dressed in all black and wearing hoods and masks used incendiary devices to ransack a restaurant, a car dealership and construction equipment, according to the Paris police prefecture. Nearly 200 people were arrested and four people, including a police officer, were injured, according to the BBC. Police had earlier warned banks, real estate agencies and car dealerships of potential violence during the demonstrations. "Activists from extremist anti-establishment groups are looking, during the traditional May 1 demonstration, to lash out violently against law enforcement as well as symbols of capitalism," police said. French President Emmanuel Macron issued a statement condemning the violent acts following the demonstration. "I condemn with absolute firmness the violence which took place today and which misled the procession of 1 May. Everything will be done to ensure that their authors are identified and held accountable for their actions," he wrote on Twitter. Two people were arrested in Puerto Rico after May Day demonstrators clashed with police while protesting pension cuts, according to Bloomberg. The clash occurred as a group of protesters attempted to enter the San Juan's banking center in the Hato Rey neighborhood and were met with a blockade of helmeted police officers wearing gas masks. Officers raised their batons and set off tear gas as protesters tried to push their way through. Police said some protesters threw rocks and water bottles at officers. The protests centered around the so-called Promesa law passed by Puerto Rico's Congress in 2016, to resolve the island's debt crisis. The law established an oversight board, which called on Governor Ricardo Rossello to begin reducing pension benefits in 2020 by an average 10 percent for some retirees. "We prefer to fight against the board rather than die in our homes without money," said Andres Miranda, vice president of the Federal Association of Pensioners and Retired People. "If Rossello gives up on defending us, we will not. We will fight for what belongs to us." In Cambodia the Cambodian Labor Confederation held a rally at the Wat Phnom Buddhist temple in the capital city of Phnom Penh, where nearly 1,000 workers gathered to demand the monthly minimum wage be increased from $170 to $207. President of the confederation Ath Thorn also raised concerns about the 2016 Trade Union Law, which has been criticized for stifling unions, but said the government has become more attentive to workers needs. "We can see the prime minister cares more about the workers this year after 10 years of working in the sector," Thorn said. Amazon, the largest employer in Seattle, Wash., locked its doors and began requiring key-card access to the front doors of buildings throughout its campus Tuesday morning in preparation for May Day demonstrations, the Seattle Times reported. A man was arrested for throwing a rock at the Amazon Spheres, spherical greenhouses located outside the online retailer's Seattle headquarters, Seattle police said. The March for Immigrant and Workers Rights was scheduled to hold a May Day rally in Seattle for the 19th year on Tuesday afternoon, as other groups also prepared their own events.